Hard water stains often form on glass after tap water containing high levels of calcium or magnesium has evaporated on the surface. As the minerals dissolve, they leave behind white, cloudy or hazy spots that can be difficult to remove using regular glass-cleaning products. Fortunately, several inexpensive, natural products you likely already have in your home can effectively remove the unsightly stains and leave your glass looking clean and shiny. 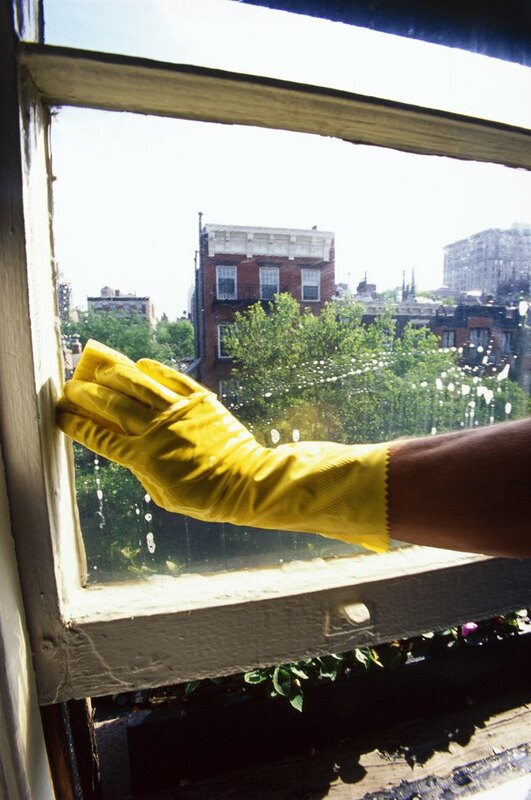 Remove hard water stains regularly to keep windows looking clean. Combine equal parts warm water and distilled white vinegar in a small spray bottle. Squirt the solution directly onto the hard water stain. Allow the solution to sit for about 15 minutes, which gives the acetic acid in the vinegar time to penetrate and dissolve the stain. Use a green scrubby pad or a soft-bristled scrub brush to gently scour away any remaining mineral deposits. Wipe all cleaner residue from the glass using a damp, soft sponge. Dry the glass with a small rubber squeegee or a clean, soft cloth. Pour undiluted distilled white vinegar into a small spray bottle. Spritz the solution directly onto the stain until it completely covers it. Allow the solution to sit for about 30 minutes. Combine equal parts table salt and baking soda in a small container. Slowly add enough water to create a paste about the consistency of toothpaste. Dip a clean, damp sponge into the paste and smear it directly onto the vinegar-soaked stain. Scrub gently until the hard water spot disappears. Rinse the glass well with a soft sponge dampened with clean water. Polish the glass with a clean, soft cloth. Combine 1/2 cup of distilled white vinegar, 1/4 cup of baking soda, 1 cup of ammonia and 1 gallon of warm water in a bucket or large plastic container. Dip a soft-bristled scrub brush or a green scrubby pad into the cleaning solution. Gently scour stubborn mineral deposits until no more stain remains. Rinse the cleaner from the glass surface with a soft sponge dipped in clean water. Dry the area with a soft, clean cloth or a small rubber squeegee.